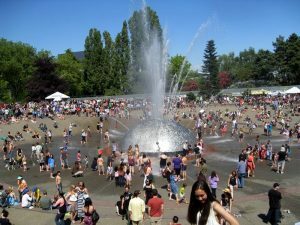 The fountain at Seattle Center attracts people to sit near or get in the water and play. What features create “a sense of place?” At the Coffee Talk on Thursday evening, May 24, we considered why some places attract people more than others. As we looked at pictures of places which we recognized, we considered why, for example, the fountain at Seattle Center is such a magnet and always has crowds of people around it. The fountain appeals to the senses (the sight and sound of the water, the feel of the spray on your face), it has movement, and it is accessible – in fact, you can get right into the water if you wish. In contrast, city streets which have too much pavement, buildings with blank walls and no color are lifeless, boring and oppressive. 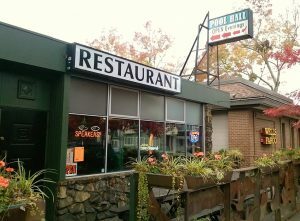 We want Wedgwood’s commercial corridor to be attractive and walkable, with interesting storefronts. As more development takes place along 35th Ave NE, what influence can we have to bring about thoughtful, beautiful, interactive, and sustainable design in streetscapes and buildings? The Coffee Talk series is part of the 35th Ave NE planning process, a cooperative effort of Wedgwood and nearby neighborhoods with a stake in how future development could transform the arterial. 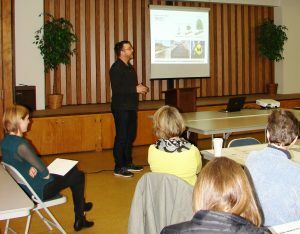 At Thursday evening’s Coffee Talk, Brice Maryman of SvR Design Company explained how combining beauty, function and sustainability can create places where people want to “be.” Mr. Maryman gave examples of projects he has worked on, such as Winslow Way on Bainbridge Island. Instead of strict division into traffic and pedestrian lanes, the street was given zones for travel. Instead of crowning the street (higher in the middle) so that rain would run off into drains at the sides, bioswales (also called rain gardens or stormwater planters) were created in the center of the street to collect water. The water then seeps down into the soil, helping to filter out pollutants. Is Wedgwood’s business district attractive and pedestrian-friendly? As we consider the changes that may come with future commercial development along 35th Ave NE, we need to get ahead of the curve and be prepared to interact with city regulations and the plans made by developers. What should we ask for to make 35th Ave NE more attractive to walk along, and a better environment for neighborhood businesses? What are the elements of livable “streetscape?” Some of these elements are: width of sidewalks, the height, bulk and scale of buildings, impervious surface versus green areas, and flat blank walls versus variety and interest such as walkways, plantings or art. The 35th Ave NE planning process seeks to implement the goals of Wedgwood’s Vision Plan in streetscape, zoning and traffic issues. The next Coffee Talk will be on June 21st on the topic of “Density and its Benefits.” Mark your calendar to attend and participate in shaping the future of 35th Ave NE.